Francie and I both were getting pretty discouraged this weekend. All of the labor of last weekend and this Saturday (Sept. 20) hadn't changed the look of the room very much. 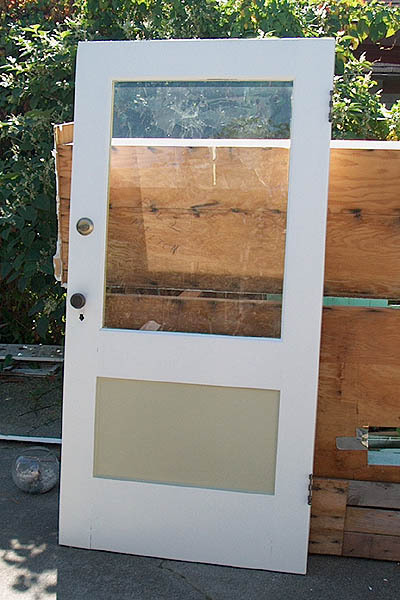 The door was stripped the rest of the way and given it's final paint job (yea!). 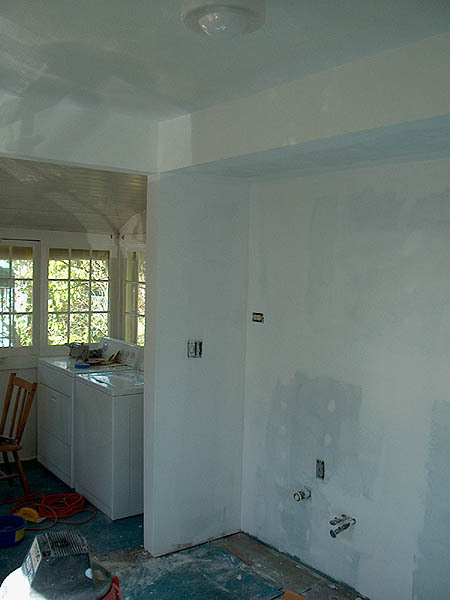 We finished sanding and then priming the walls on Saturday night which merely brightened the room a little without giving us much of a sense of accomplishment. After spending all of Sunday morning with the grunt-work of prep'ing and cleaning the window trim and the bead-board in the laundry room, we felt like we hadn't done much. 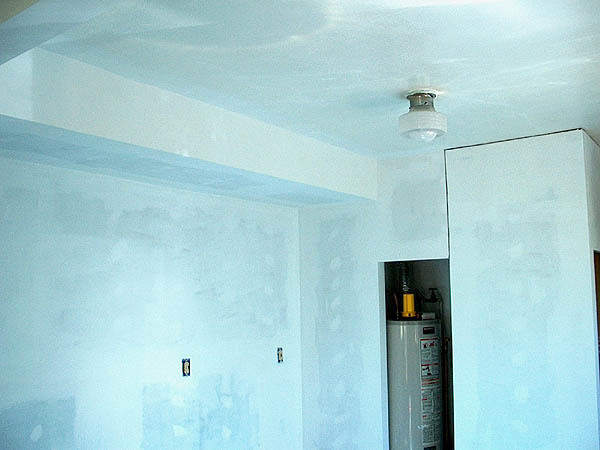 But then came time to slap some paint on the ceiling and walls! We were so encouraged by the progress with the ceiling that we pressed on with a late night and got MOST of the walls done, too! One evening this week should finish the first coat. Next weekend comes the second coat, then the floor underlay and hanging the first cabinets! The door has it's final colors! 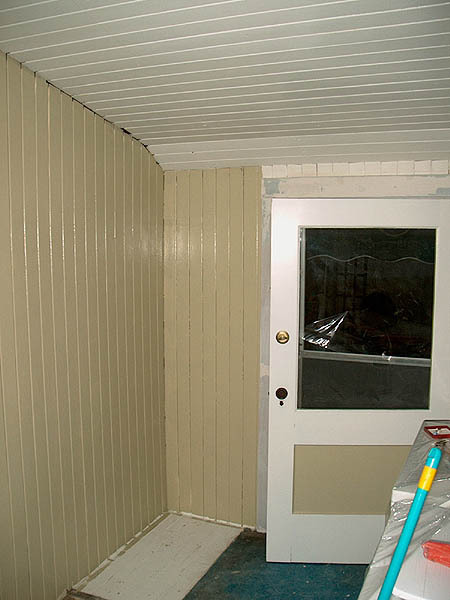 The main color is the color for the ceiling and the trim while the panel shows the main wall color. The area above the soffit and the "arch" still need paint, but the rest of the room has its first coat. 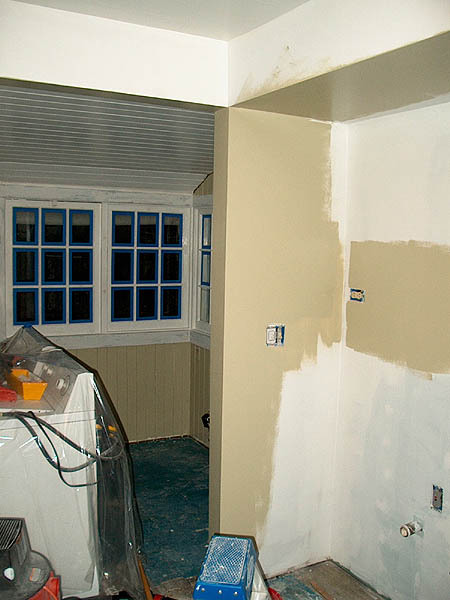 The scattered paint seen here is all that will show once the cabinets and tile are in. The wall color darkens the room a bit and makes it feel a little smaller. Definately going to need some brighter lights in here! 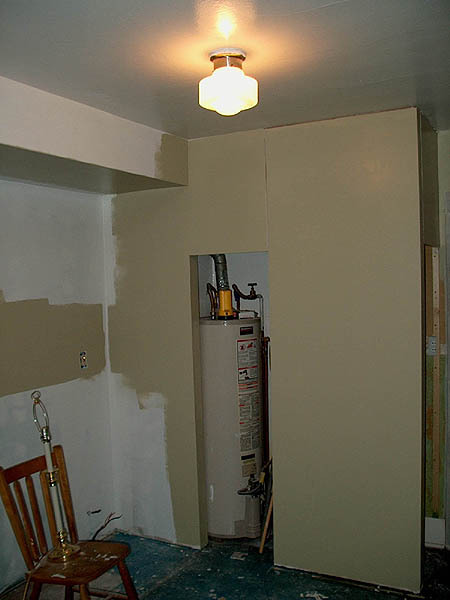 Actually, this is where the fridge and pantry will be, but you can see how vastly improved the bead-board is with its fresh paint.